Harry Potter has been in my life for as long as I can remember. On the 26th of June 1997, Harry Potter and The Philosophers Stone was published in the UK. I would have been 8 months old and little did I or anyone else realise what an impact it would have on my life. The first Harry Potter film I went to see at the cinema was The Prisoner of Azkaban, and it remains to this day my favourite book and film. I really can't put into words how much the books, films and characters of this fantastic series mean to me. Every time I open the books, it feels like I'm returning home; every page reunites me with old friends and every adventure I get to relive. 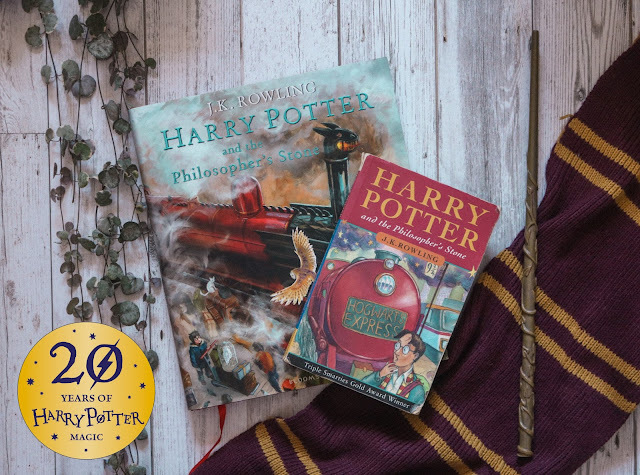 Harry Potter has touched so many lives throughout the publications of the books and the releases of the films, and now we have The Cursed child and the Fantastic Beasts films, it truly does show that the magic will always live on. Bravery, kindness, understanding, hope and most importantly, love. These are all things that the book series have taught me, and it all started with The Philosophers Stone. Harry Potter will always be with me. I will read it to my children, my friend's children and they will read it to their own children. The magic will always live on, within us and within the wonder of the books and films. Thank-you for 20 years of magic.